Gloss is a common appearance attributes used to describe a product appearance. However, visual appearance of a product cannot be adequately described using gloss. 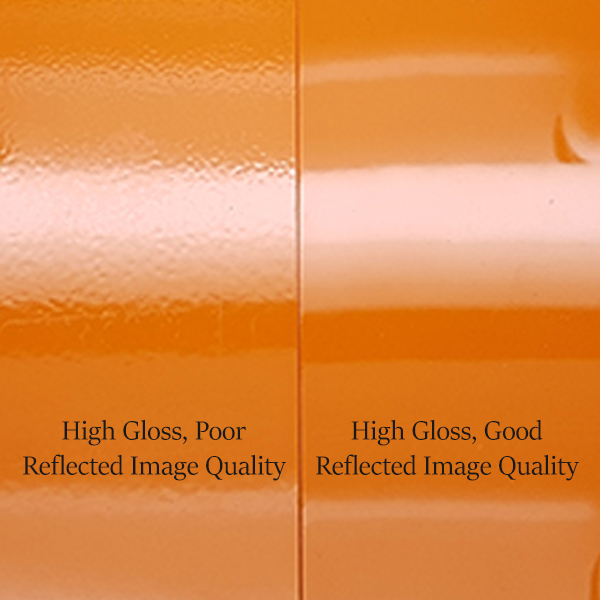 Two surfaces can have identical gloss readings, but very different visual appearance and reflected image quality. This discrepancy is due to the limitation of gloss meter technology in detecting rough (orange peel) or/and microscopic structures (haze) on surface. Reflection haze can cause surface to have poor reflected image contrast with halos around it. It is caused by the micro textures on a coated surface changing the direction of reflected light. Some of the potential causes of reflection haze are poor dispersion, raw material incompatibility and polishing or abrasion. The term “orange peel” is used to define a bumpy and rough surface texture that is caused by incorrect formulation or poorly applied coating. This undesirable texture distorts reflected light, causing fuzzy reflected image on surface. Both Distinctness of Image (DOI) and Reflected Image Quality (RIQ) parameters are capable of quantifying orange peel with the latter having higher resolution that correlate with human perception. The 2 panels in figure 1 shows vast difference in their appearance but marginal difference in their gloss readings. 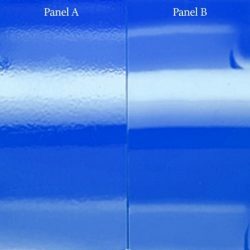 When further analysed using HAZE, DOI and RIQ parameters, we can see that panel A is exhibiting higher haze and poorer reflected image quality. Moving beyond gloss measurement, additional appearance parameters like HAZE, DOI and RIQ are necessary to obtain a comprehensive product appearance evaluation. Appearance meter like Rhopoint IQ-S is able to measure gloss, HAZE, DOI and RIQ simultaneously, providing a cost-effective solution to visual appearance measurement. Get in touch with us to learn more on visual appearance measurement or to schedule a free product demonstration.